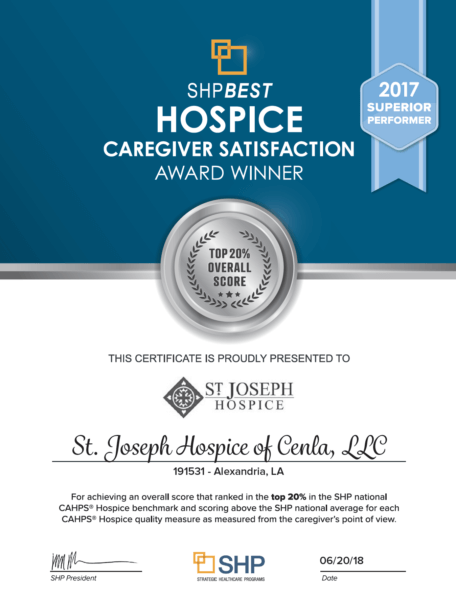 Alexandria, LA – St. Joseph Hospice of CENLA, a division of The Carpenter Health Network (TCHN), recently received the “2017 Best Superior Performer” award from Strategic Healthcare Programs (SHP) for ranking in the Top 20% of hospice agencies for quality outcomes and overall patient satisfaction. The SHPBestTM program annually recognizes home care providers that consistently deliver superior service to patients. Awards are based on provider rank in overall score compared to all eligible providers in the SHP database during the calendar year. Quality outcomes and overall patient satisfaction are measured utilizing the Consumer Assessment of Healthcare Providers and Systems (CAHPS) Hospice Survey. The CAHPS Survey, developed by The Centers for Medicare & Medicaid Services (CMS), is a standardized survey designed to evaluate and rate the experiences of patients who died while receiving hospice care, as well as those of their caregivers. For more information about St. Joseph Hospice services, contact us today.